/ Comments Off on Why Won’t My Garage Door Open? If you have ever settled into your car with the intention of backing it out of your garage, or stood outside your garage, opener in hand, all without any door movement, you’re probably wondering what’s wrong. The following tips can help you troubleshoot a garage door that won’t open, whatever the problem may be. Whether your operator is not plugged in or has lost its connection to an outlet, the inability of your garage door to open indicates that a power source is lacking. Check to make sure that your garage door motor is plugged into an operational outlet. Try plugging another appliance into the plug to make sure it is working. Modern garage doors are usually equipped with photo eyes, in order to detect the approach of a person or object in the way of the door as it closes. If there is a disruption in the connection between the sensors, the door may stop closing to minimize damage or injury. Check to see if there is anything in the way of the photo eyes, and clean them periodically with a tissue to prevent the buildup of dirt. Also, because photo eyes are electronic, they should not get wet, so be sure to use a soft, dry cloth or tissue when cleaning. 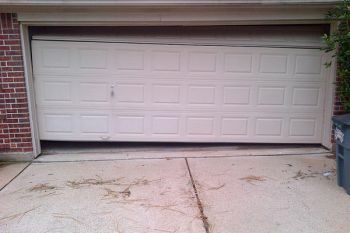 A broken torsion spring effectively disables your garage door from lifting on its own. These springs help the door lift and are rated for only a certain number of cycles, causing issues after repeated wear and tear. If you suspect your torsion spring to be broken, contact the professionals at Ponderosa immediately, rather than trying to fix it yourself, which can be dangerous. If a torsion spring is broken, the cause may have been a snapped torsion cable, which releases the taut energy of the cable when it breaks, causing damage to springs, your vehicle, or even the walls of your garage. In order to work with a snapped torsion cable, contact a professional garage door specialist to help you repair your door. If your keyless entry or remote is not working, try changing out your batteries. Remotes tend to eat up battery life, so replacing one of these may be your best bet. You can also reprogram your keypad using the operator’s instructions to see if there has been a programming error. Finally, if neither a new battery or a reprogrammed keypad helps, you may need to replace the remote itself. Contact Ponderosa Garage Doors for assistance, or reach out to your garage door manufacturer to find a remote that best suits your door. Garage door operation issues can be stressful, especially when you are on your way to work or an event. Consulting a professional to help you to handle a potentially dangerous malfunction will ensure the safety of you and your family, as well as your garage door.